If someone had told me a year ago that by now, I would be coordinating visits to Milan’s largest watch boutique for fellow MBA and masters students, I would have laughed. But here we are. Contact came through the career service administration at school. In May, I met Alessandro Bucchi, within Marketing and Communication at PISA Orologeria, and we planned a simple store visit for the start of the new school year, this past September. As part of my role as president of the SDA Bocconi Luxury & Arts Club, I have arranged visits to a handful of fashion and luxury boutiques, which are fun and informal opportunities for students to engage with a brand and learn more about their business. PISA occupies the former Burberry retail space in Via Verri 7, around the corner from Via Montenapoleone. This three-floor area houses 44 of the top Swiss timepiece brands, essentially all of what is available on the market today. Next door in the former PISA space is the Patek Philippe boutique, an intimate lounge appropriate for average transactions of well into five figures. 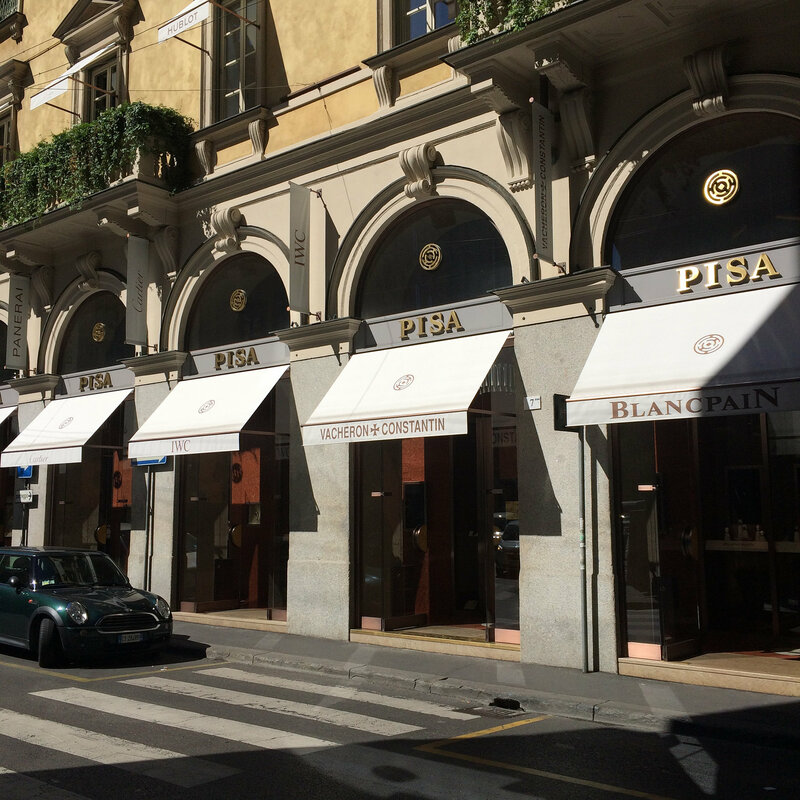 PISA also operates a Rolex flagship boutique in Via Montenapoleone 24, which we toured as well. This space was the first mono-brand Rolex store in Europe, a partnership between the brand and the retailer, and thus far, a roaring success. It is one of the only places in the world where watch repair technicians are on-site, so maintenance and issues can be addressed rapidly. The alternative is for items to be sent to Switzerland, where repairs and maintenance can take weeks. I loved the Rolex boutique—with its light wood paneling and thick carpet, muffling voices and footsteps. Also, the vertical garden along the rear wall, viewed through plate glass wall and a glass elevator shaft. Quite airy and warm, like a library. Davide Azzini-Gilardi, Assistant General Manager, explained to us that the main differentiator for PISA, at this stage when identical products are widely available, is service excellence and trust. You only develop and earn those through experience and commitment to honesty—like telling a client that the watch he likes isn’t quite right for his lifestyle, nudging him toward a less expensive but more durable piece. Because clients remember these instances. PISA has clients all over the globe who are loyal because of this high level of integrity. Because that event was so popular among students and since we nearly mobbed the place, though it is one of the largest retail spaces in central Milan so difficult to really overstuff it, PISA invited us back for a special exhibition this past Friday. To celebrate its 20th anniversary, Parmigiani Fleurier worked with PISA to place a collection of mechanical wonders on public display using the third floor of their boutique. This space is an event venue rentable for parties and gatherings, and the perfect backdrop for the meticulously restored toys, objects, and clocks from the Sandoz family collection in Switzerland. Mr. Michel Parmigiani has a close relationship with the family, as well as a veritable obsession with precision, movements, and beauty, as evidenced by his eponymous brand of ultra high-end watches, and so it was natural that he be charged with bringing the wonders back to life. And while they were prudently displayed behind glass with guards to monitor their safety, videos of their ancient wizardry played on iPads, showing: a gun which produced a tweeting bird when triggered (circa 1815 by Frères Rochat), a hopping and croaking enameled and jeweled frog, a mirror with another singing bird, and a pocket watch with telescoping hands to follow the outline of the oval face, to name a few. In Italian and French, Mr. Parmigiani led us through the story of each item, recalling its origins and the level of effort, for some over 5,000 hours were necessary to properly restore its operation and aesthetics. It was a wow moment for me on several levels: to see such antiquity close up outside of a museum, along with access to such a highly-regarded Swiss timepiece brand. Through my reading and research and knowledge of retail, I’d heard the Parmigiani Fleurier name (there is a PF boutique in Miami), but never imagined I’d meet the founder, realize its history spans just twenty short years, and try on my wrist a watch costing €124,000!! Maryline De Cesare, managing director, and Giulia Pititto, sales and marketing coordinator, both of PF Italy, cordially hosted us after Mr. Parmigiani’s speech and discussed the challenges of working with such a high end but young and niche brand. Whereas Rolex and Cartier watches tend to sell themselves, a Parmigiani takes effort and education, on the part of both corporate marketers and intermediaries (retailers) upon the final client. Its uniqueness as a product is something to be celebrated, among the landscape of major conglomerates which dominate Swiss watchmaking and spend millions every year on advertising. This is the way they like it, though. Parmigiani Fleurier is fully independent and fully vertical, with all elements of production in-house. If you know watches, you know this is quite rare. And so, it was a partnership of passions. Michel Parmigiani and his niche maison with the Sandoz collection of antique mechanisms, joined with PISA, a temple of time retailing that is also family-owned and -run, insistent on quality of product and service. PISA’s Alessandro Bucchi and his colleague Davide Azzini-Gilardi have been very gracious to us, and I am thankful for that. It is a unique place with kind people, and it has been a pleasure to visit twice, both to see its own inner workings and the exciting stories behind the Parmigiani brand, which PISA proudly sells. Hopefully it will not be the last of my interactions with the store or the brand!